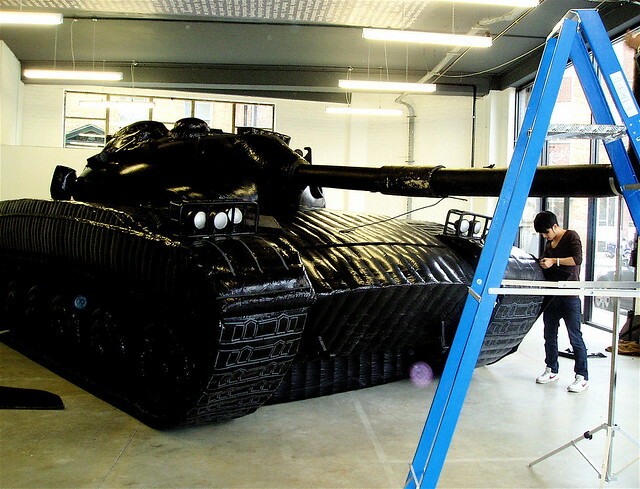 Fake tank, 100% Design, London 2007. I’ve been thinking about guns a lot since the shooting in Tucson of Congresswoman Gabrielle Giffords and nineteen others on Saturday. Clearly the shooter was deranged. His kind of shooter, by definition, always is. And whether or not the malevolent political climate is to blame, this massacre has focused attention on the emergence of the gun, especially high-powered automatic weapons, as the political symbol of choice on the right. The fashion among Tea Partiers and their ilk for showing up at political rallies with their biggest guns on display is disturbing for a number of reasons. First, there’s the implied threat; vote for our candidate or else… But more than that, all the gun waving strikes me as cheap symbolism, a time-tested shortcut for attracting attention. So what, if you don’t have a coherent message? Violence sells. Ask Hollywood. You don’t need a plot to sell movie tickets as long as there’s lots of shooting. Ask video game manufacturers. The gun waving wingnuts aren’t just making a statement about their Second Amendment rights. They’re maximizing box office. They’re inflating the visibility of otherwise utterly marginal politicians. Over the past month or two, I’ve been reading a doorstop sized book called Faust’s Metropolis: A History of Berlin by Alexandra Richie. It traces the city’s history from the Middle Ages and ends in the 1990s. On Saturday, as it happens, I was reading the section about how Hitler dispatched a young Joseph Goebbels to Berlin in 1926 to build support in Germany’s capital for the Nazi party. At the time, there were only 200 party members in the city, as compared to 250,000 members of the Communist Party. His very effective strategy was to attract attention by inciting violence, specifically street brawls between his cadres and the Communists. And also to demonize the enemy: the Jews, the capitalists, and the Weimar government, which the Nazis painted as too weak to maintain order. Goebbels in short: to achieve power, you incite violence and then assign blame. So far, we’ve been luckier than the Weimar Germans. The cheap symbolism hasn’t been especially appealing to voters. But it has made an impact on our political culture. Whether or not the intensified gun waving of the past two years (and related acts of actual violence) influenced the kid in Tucson, the embrace of the automatic weapon as a political symbol makes it that much more frightening for elected officials to step up and do what needs to be done, to restrict access to such weapons. P.S. 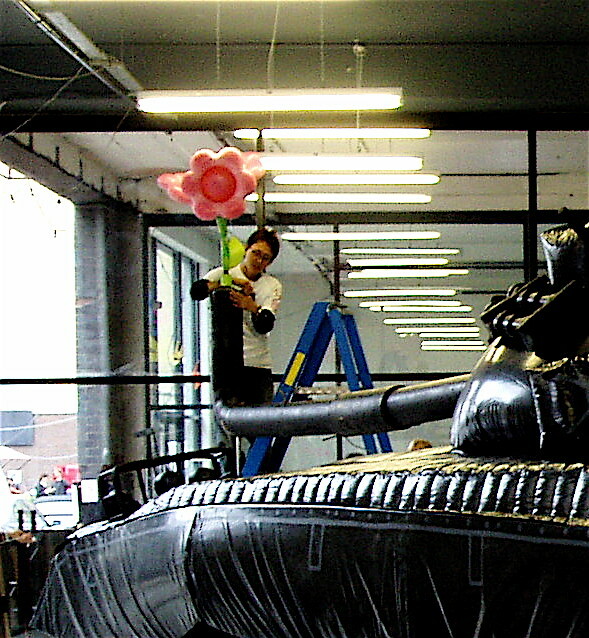 Maybe the best response to the cheap symbolism isn’t to ignore it or shout it down, but to subvert it. P.P.S. Speaking of Joseph Goebbels, Sarah Palin just introduced the term “blood libel” into the debate.